Not to infringe too much on Craig Bacon's book reviewing in this virtual space, but I feel the need to once again relate life to a book I've just completed. So please, indulge me. Since I last graced this webpage, I've completed three more novels. One was Glass Town (see Craig's review here), one was The Gone World (a crazy-good time traveling romp that some readers have likened to the film 12 Monkeys, and with good reason), and, most recently, I found myself enthralled with Matt Haig's latest work, How to Stop Time. I first found out about this book a while ago when I saw it suggested through my Amazon account. You all know what I'm talking about: "Based on your previous purchases, you might like this!" I had kept the novel's title in the back of my mind, and I managed to borrow it from the Lee-Whedon Library a few weeks ago. I had a few others checked out at the time, but once I got a chance to open Haig's work, I found it difficult to put down. The story follows Tom, who has a problem with aging. Essentially, he doesn't age. At least, he doesn't age like a normal human. Told from Tom's point of view, and using the setting of 2017-2018, we learn rather quickly that Tom was born 450 years ago, he had one true love in his life, one special kind of love in his life, and he has no real idea how to live his life anymore. In an attempt to find himself, Tom "moves back" to London, a place he lived centuries ago, and becomes a high school history teacher. At the high school, Tom meets a woman named Camille, who cannot shake the feeling that she knows him. A variety of circumstances lead to her figuring out how and why she recognizes his face, and he is ultimately forced to explain his condition to her. Their budding relationship gets interrupted when Tom is called away by the mysterious Hendrich, who is actually twice Tom's age and has spent several lifetimes organizing all of the people with the anti-aging condition so that they can remain secret from the world. Tom dutifully follows Hendrich's orders, but he does so with such contempt that the reader is left wondering why. The final part of the book that follows Tom through this ordeal is incredibly worth the ride, however, as Tom nearly hits rock bottom before bouncing back and living. Haig's weaving of the time periods and truly "old" friends of Tom manages to come full circle in quite a satisfying way. But the focus always remains on Tom's life, and how he wishes to go on living. Living. Indeed, if there was anything Haig captured in this beautifully written book, it was that life should not be wasted on things that cannot be controlled. You could argue that this entire book is a variation of the phrase, "Don't measure life by the breaths you take, but by the moments that take your breath away." As stated above, Tom had one true love; a girl named Rose. Rose was someone he met in the 1590s, and anyone lucky enough to have found that special someone could read Haig's words and find themselves nodding along. As Rose and Tom are about to kiss for the first time, she asks him, "If you feel for someone, just one single kiss can stop the sparrows, they say. Do you think that can happen?" "I closed my eyes and the rest of the world faded. There was nothing else. Nothing but her. She was the stars and the heavens and the oceans. There was nothing but that single fragment of time, and this bud of love we had planted inside it....and the church bells rang in the distance and everything in the world was in alignment." If you've lived enough to have had such an incredible experience as finding that special someone, then the above paragraph is pretty incredible, is it not? "I loved her, instantly. Of course, most parents love their children instantly. But I mention it here because I find it a remarkable thing. Where was that love before? Where did you acquire it from? The way it is suddenly there, total and complete, as sudden as grief, but in reverse, is one of the wonders about being human." Again, I ask to all you parents reading this: Ain't it the truth? Throughout the flashbacks in the book, we learn that despite Tom's fears of his life today, his life in the past has included drinks with Zelda and Scott Fitzgerald, lute playing for Shakespeare's theater company, and dining in a restaurant frequented by Charlie Chaplin. To call his life incomplete, at least on the surface, would be folly. But like all of us, there is something deeper that drives Tom to continue living, and at its core that something is simple: love. 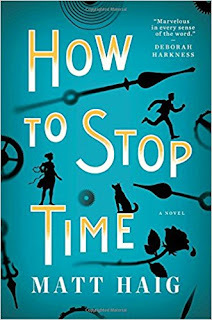 A few times during this book, Tom mentions how Hendrich worries about the non-aging population being discovered, and how certain companies are researching how to, in fact, "stop time" for the average human. Though it is not mentioned outright, I'm sure a major philosophical debate can be had on the disadvantages of immortality or severe extreme old age. However, in the end, Tom's experiences lead one to believe that the power of emotion is strong enough to stop time. You could say, I suppose, that "love conquers all." Howie Balaban hasn't read this many books since he was in 6th grade, but should complete no. 14 of 2018 by the end of March. Send any recommendations his way, and perhaps he'll find meaning in them, too.